With the new TIBCO Spotfire® A(X) Experience, we are revolutionizing analytics and business intelligence. This new platform accelerates the personal and enterprise analytics experience so you can get from data to insights in the fastest possible way. 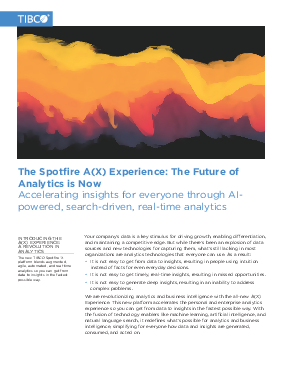 With the fusion of technology enablers like machine learning, artificial intelligence, and natural language search, the Spotfire® X platform redefines what’s possible for analytics and business intelligence, simplifying for everyone how data and insights are generated, consumed, and acted on. Download this whitepaper to learn more, then check out the new Spotfire analytics. It’s unlike anything you have ever seen. Simple, yet powerful, it changes everything.